school and cigar box, and binder manufacturers. usa. a local family-owned office supply company in the memphis area,offering office supplies, printing, office furniture, machines, janitorial supplies/equipment and computer. Binders, shredders, laminators and a complete line of office supplies and office equipment. manufacturer of office furniture, office chairs, office desks, racks and parts. Virtual business office, including mail receiving, live operator telephone answering, office and conference room rentals, and secretarial services. Full-service virtual office locations in the United States, Canada, and Europe. Offers customized business solutions such as office rentals, mail and receptionist services. office furniture manufacturer and design of chairs and partition systems for export. includes e-catalog. office in taman perindustrian subang, with overseas representatives. Offering virtual office services such as mail receiving, live telephone answering, editing, research, office space, conference room rental. Based in Chicago, IL. Offers office and desk toys, stress balls and executive toys for the office. Developer of network office appliances, and the manufacturer of eCabinet, the first network office appliance to automatically capture, digitally file, and retrieve office documents like emails, faxes, photocopies, scans, print-outs and web content. Administrative Support, Virtual Office, Medical Transcriptions, Tape Transcriptions, Internet Research, Office Support. Intended specifically for physician office practices and physician office managers. Provider of forms and home office supplies. Includes business supplies, checks, labels, greeting cards, announcements, invitations and business printing. Also provides retail, medical and office supply. A bimonthly newsletter designed for the small office setting, providing information on medical office management topics. The credit union offers Member Direct and banking services at locations throughout the Annapolis Valley from its Head Office. Lists officers, office hours, contact details and links to every branch. Design, sales, and installation of new and used office furniture and cubicles. specializing in all types of file storage and office filing systems. office systems, workstations, desks, tables, and storage components. manufacturer of metal legs for office desks and partitions for workstations. makes office chairs and armchairs for office, bars and restaurants. Specializing in communications for the small office and home office (SOHO) business - web and print. manufacturer of office accessory and literature display products for the business or home office. czech manufacturer of office furniture including desks and tables, cabinets, and office accessories. If the business hours of general box in may vary on holidays like Valentine’s Day, Washington’s Birthday, St. Patrick’s Day, Easter, Easter eve and Mother’s day. We display standard opening hours and price ranges in our profile site. We recommend to check out generalbox.com for further information. 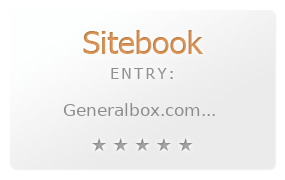 You can also search for Alternatives for generalbox.com on our Review Site Sitebook.org All trademarks are the property of their respective owners. If we should delete this entry, please send us a short E-Mail.